I’m so ecstatic to see the number of Baguio food questers growing. It’s fun to find out too, that there are many more people getting into the business of providing the City of Pines with good stuff to eat. On with our Amare experience! Race and I still did a little checking, the few minutes before we actually met with Beth. It was pretty easy to find Amare La Cucina because the wood fire brick oven pizza (and more) establishment did a really good job of setting up signs to their place. We got there a little before 11:00 a.m. where the owner told us, they’d be open in a few minutes. 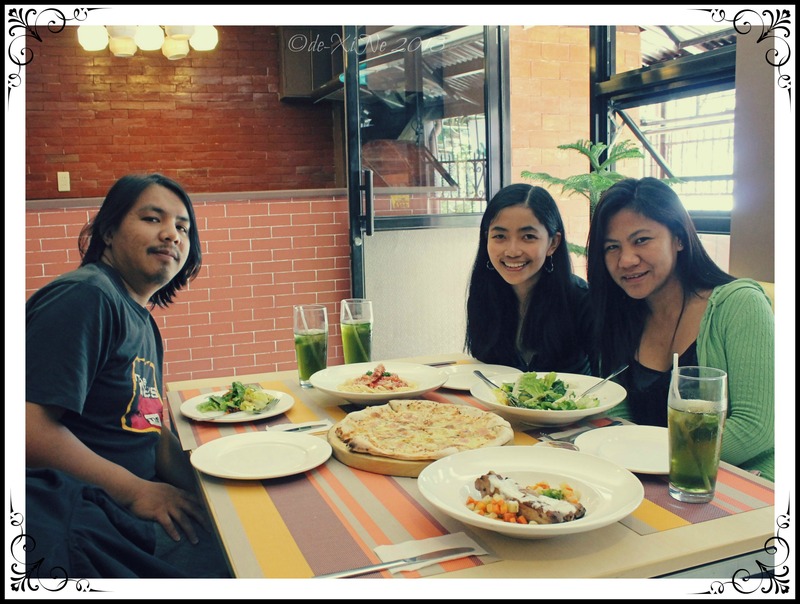 It was good time to go and meet Beth who’s been craving for pizza. Mint iced tea … see the greenish tinge at the bottom of the glasses? That’s the minty flavor. Give your beverage a little stir. Back as P2+1, we got one dish from the salads, the pasta, the ribs (the one and only), and of course, the pizza. We also inquired about the size of the pizza and our lady attendant said charmingly, it was something from 12 to 14 inches. 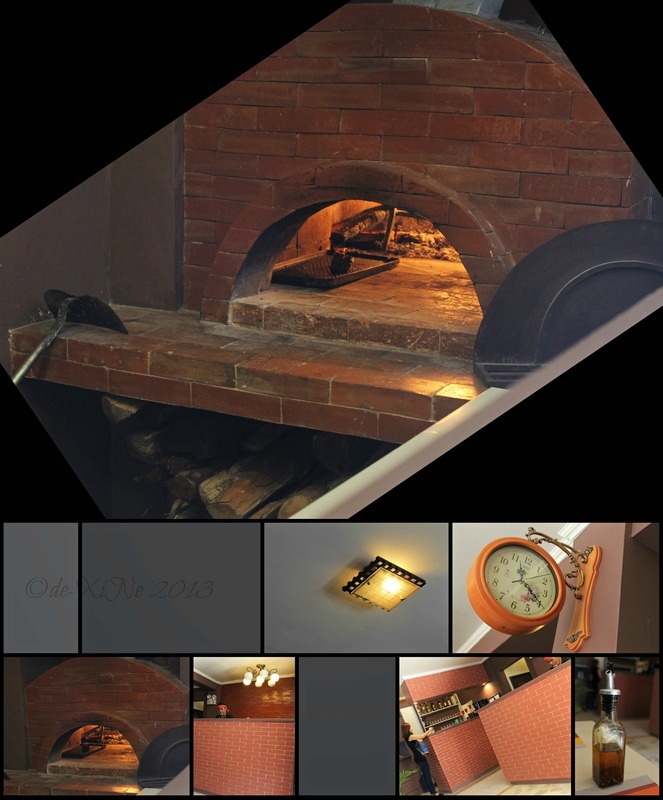 =) Remember guys, it’s brick oven baking. 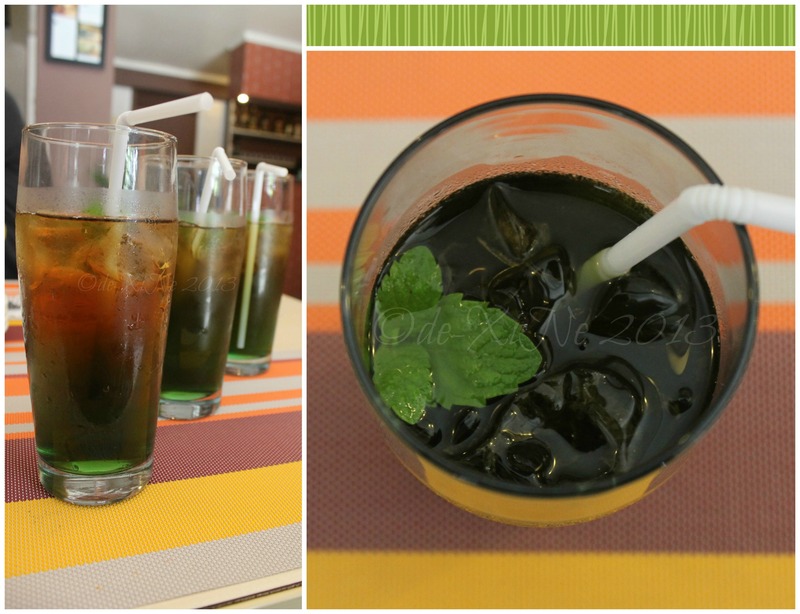 We then waited for our food taking little sips of mint iced tea from our glasses. It was a delicious plate of greens. I did want a little bit more of the special sauce but that didn’t really matter once I got to the arugula and the caramelized walnuts. Yum, I thought in getting that nutty flavor in my mouth. Hooray for dried tomatoes, too. Fresh from the oven, our pizza came. Ooh, how the aroma filled the air. 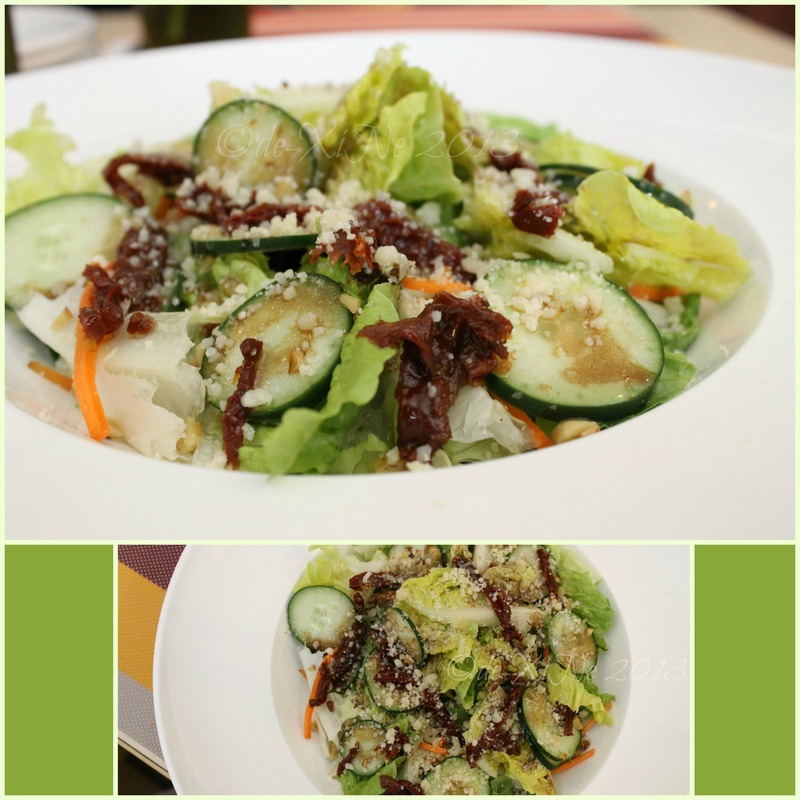 Salivating for the fragrant pizza, I finished the salad on my plate quickly. In getting a slice, I found it to be both thin (middle part) and thick (ends) crust pizza which is a good enough combination. The bite I took out of it was mildly flavored. But it’s better mild than extreme, nothing a dash of chili oil (which is Amare’s hot sauce seasoning) and a little sprinkling of salt can’t fix. Hhhm, maybe more bacon saltiness? *nomnomnom, chewy dough. He did give us a piece of the meat and some vegetables. With what I got, I thought the meat was tender enough. Don’t expect it to be fall of the bone because this was cooked in the brick oven too. For a little flavor, dip or pour on the garlic sauce. As for the veggies, it reminded me of the stuffing in empanada. Good, right? Yiiis. One of the most excellently cooked pastas I’ve ever had. To think, the noodles were fettuccine. 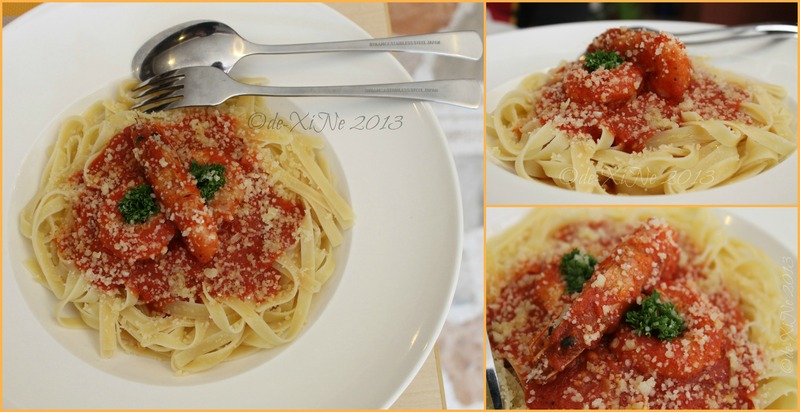 \m/ The sauce: pure tomato with just enough prawns for Beth, Race and me. Dash of salt for Ms. Salty here … me. 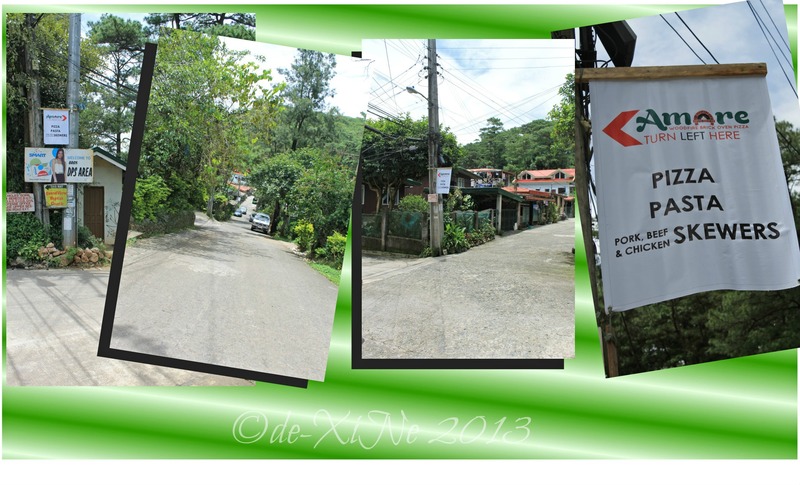 X marks Amare for good food in Baguio. 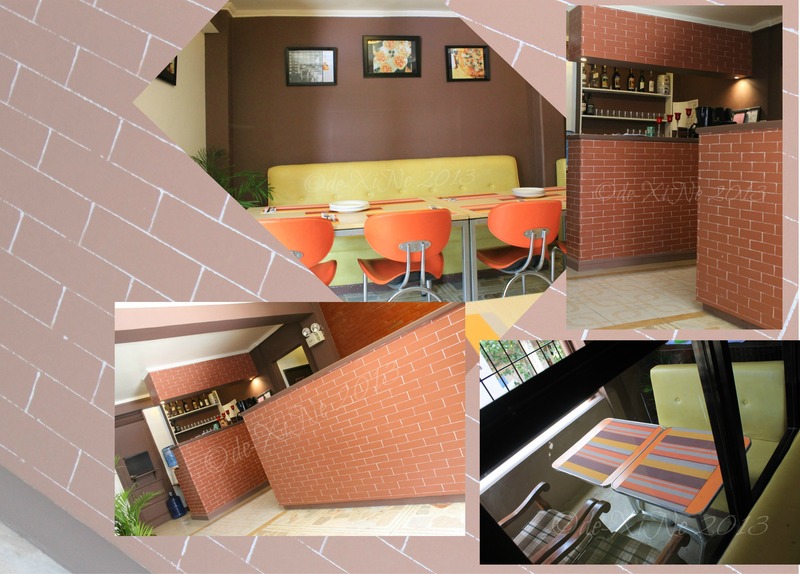 It’s all about the love of Amare’s kitchen and food … love their kitchen, love their food. Visit them soon! P2+1: Lovers of the kitchen and its food. Sadly, we (this P2+1) can’t do much in the kitchen. *hihi MIA: The one who knows her way around it. Wish you were here, Karla! ^^, Get well soon! Biiiig hugs! Ambiance: The pizzeria is a little small and with everyone wanting a taste of a brick oven pizza, it can get crowded pretty quickly. The way to Amare. Follow the signs please. DPS Compound Brgy. (After Mario’s before the road going into South Drive), down the road turn left. UPDATE 12/28/2013: Amare La Cucina is moving to Egi Albergo Di Ferroca Hotel. They’ll be (re)opening their doors and firing up their wood brick oven in January. UPDATE 12/28/2013: Amare La Cucina is moving to Egi Albergo Di Ferroca Hotel, where Gustaeu‘s is. They’ll be (re)opening their doors and firing up their wood brick oven in January. Hello there, elakatrina! To be sure ba? Sayang money if it doesn’t work out no? =b Thank you, thank you so much for the support! thanks for the new info, we’ll definitely go there! Hello there, Cynths! You’re welcome. 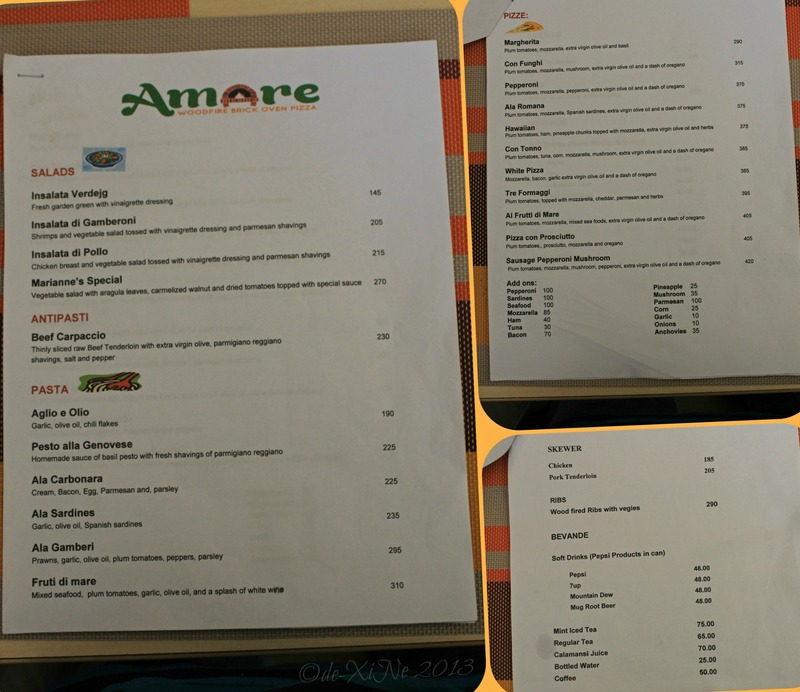 (“,) Enjoy at Amare! 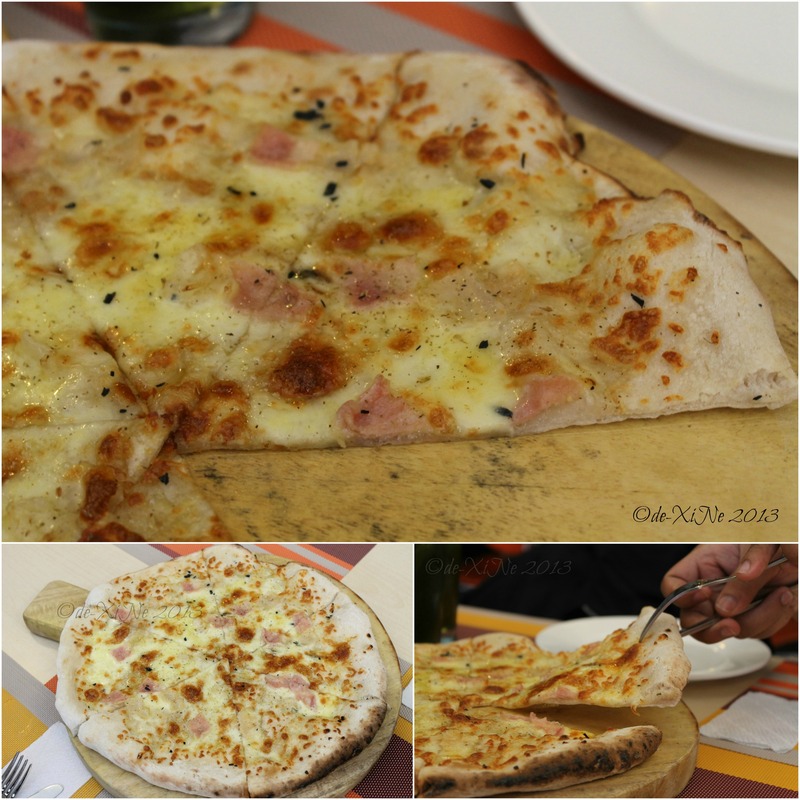 It’s very generous of you to have shared your great gastronomic experience at Amare La Cucina on your blogsite. We are truly overwhelmed with joy and excitement to know that we can make many people happy through the food that we serve from our kitchen. 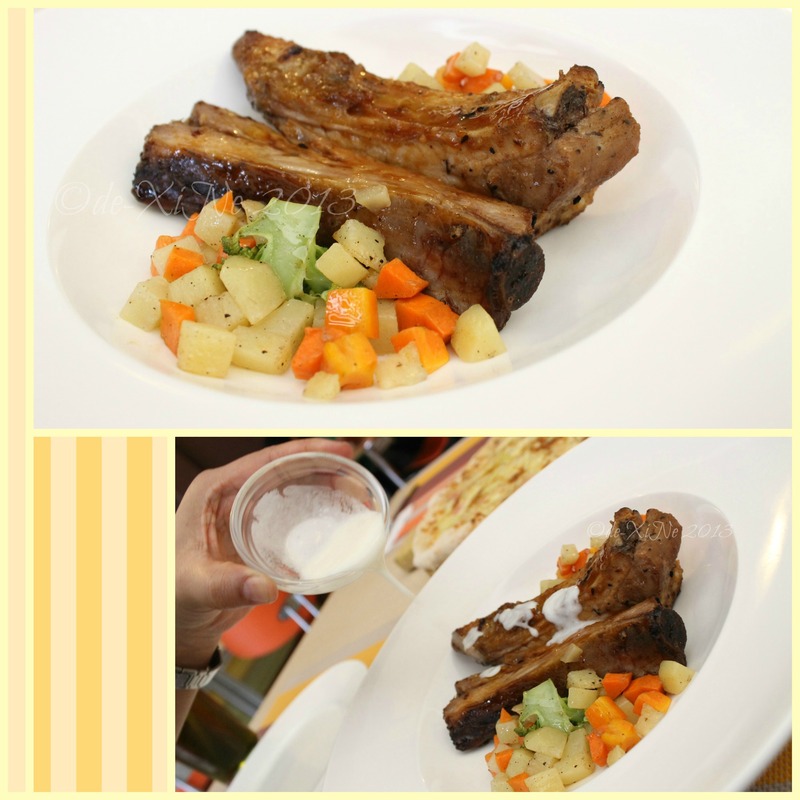 It inspires us more to know that the taste and aroma from our dishes can warm the hearts of our customers. Samuel Taylor Coleridge was right when he wrote, “what comes from the heart goes to the heart…” And this, with heartfelt service and humility, is what we constantly endeavor to serve the people of Baguio: food from the kitchen, prepared and served with love. Carry on please. We really appreciate the service you’re providing for Baguio! 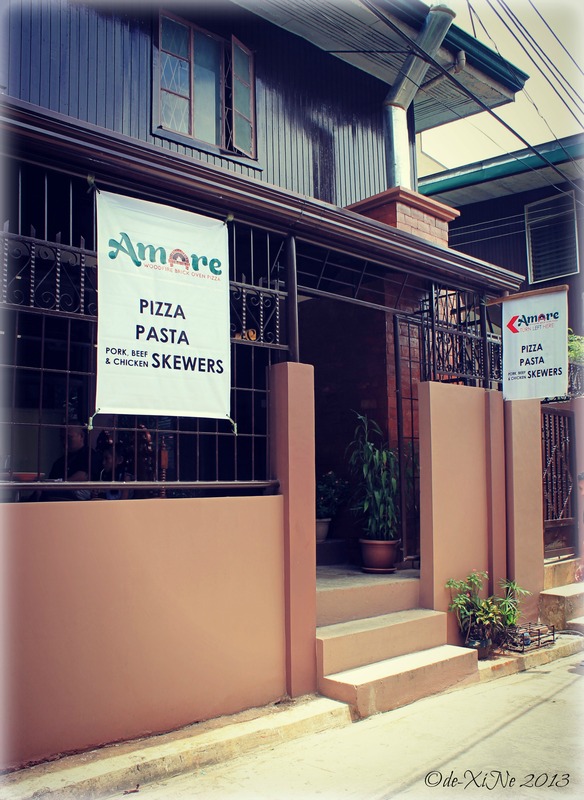 Here’s to more good eats from Amare’s kitchen. More power to you all at Amare! Are you catering for birtday parties?